The guests are here and they are hungry! Serve them their favorite sweets in this delicious game of dishing desserts. Be the best waiter at the cafe, and make sure all the guests get their Just Desserts! Looney Labs—best known for the FLUXX family of games—has opened a restaurant and wants to employ you in serving the best desserts that you can. For the restaurant serves only desserts and only desserts (or puddings), never starters, main courses, or the cheese board, and it does so to a clientele that is very particular about what it does not like. Serve the right customers the right desserts and you can be the best waiter or waitress. 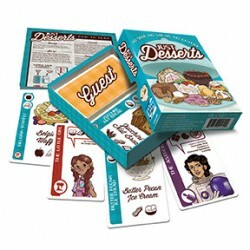 This is the set up for Just Desserts, a new card game from Looney Labs that is designed for two to five players, aged eight and up with a suggesting playing time of ten to forty minutes. It consists of two decks of cards, the Dessert Deck and the Guest Deck. The Dessert Deck consists of dishes such as Pecan Pie, Fruit Salad, and Baked Alaska. Each of these is named and illustrated and is also marked with one or more Taste Icons of which there are twelve in the game. For example, Fruit Salad consists of one Taste Icon, which of course, is Fruit; Pecan Pie consists of the Nuts and Pie Taste Icons; and Baked Alaska is made up of Fruit, Cake, Ice Cream, and Chocolate Taste Icons. The Guest Deck is made up potential customers divided into six suits (measuring jug/blue, spatula/green, mixer/red, oven glove/orange, chef’s hat/yellow, and rolling pin/purple). Each Guest is named and illustrated, given a card colour and suit, the Taste Icons that he likes and dislikes as well as his favourite desserts. For example, The Lumberjack likes Ice Cream and Cookies, but not Nuts, and her favourite desserts is Ice Cream Cone. Some Guests have more than one Favourite Desserts. For example, The Emperor likes Devil’s Food Cupcakes and Chocolate Angel Food Cake. To win Just Desserts a player needs to serve the right desserts to the right Guests. This requires that he successfully serves three Guests of the same suit or five Guests of different suits. At game start each player receive three Dessert Cards and three Guest Cards are played face up unclaimed. On his turn a player draws a new Dessert Card and a new Guest Card then does one of three things. These can be ‘Satisfy up to two Guests’, ‘Go back to the Kitchen’ (and draw an extra Dessert Card), or ‘Dump the Tary’ (discard Dessert Cards and then draw back up). To satisfy a Guest, a player matches the Taste Icons on the Dessert Cards in his hand with those on the unclaimed Guest Cards. For example, The Hippie likes the Ice Cream, Chocolate, and Fruit Taste Icons. A player matches these using the Fruit and Ice Cream Taste Icons on Strawberry Ice Cream and the Chocolate Taste Icon on Peanut Butter Cups—in doing so, he also ignores the Nuts Taste Icon on the Peanut Butter Cups as The Hippie does not mind Nuts. Having successfully served the Guest, the player adds her toward his winning total. Now The Hippie has two Favourites—Neapolitan Ice Cream and Banana Split—and if a player can serve her one of these, he not only adds The Hippie to the Guests that he has successfully served, he also gets a Tip, which means that he can draw an extra Dessert Card. If at the end of a player’s turn there are two or more unclaimed Guests of a matching suit, then one of them must be discarded. Although added to the discard pile, he is regarded as ‘standing in the doorway’ and can still be served and claimed by another player. As soon as another Guest has to be discarded, the previous Guest has left and cannot be claimed. This then is the basic game. Three advanced rules provide player interaction. ‘Poaching & Blocking’ enables a player to steal a Guest from another player by satisfying his preferences, though can be blocked if the owning player can re-satisfy his Guest. By ‘Opening a Buffet’ a player discards four Dessert Cards with single Taste Icons to force the other players to move one of their satisfied Guests back to being unclaimed. ‘Surprise Parties’ allow a player to interrupt another player either satisfying or Poaching a Guest by using that Guest’s Favourite dessert. Unfortunately, the player does not get a Tip for this. 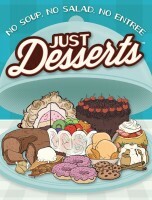 Physically, Just Desserts is nicely done, with cheery, full colour artwork. The rules are well written and clearly presented. One issue with Just Desserts is that the designer does overestimate the playing time—twenty minutes is a more reasonable estimate than the given maximum of forty. Further, matching the Taste Icons may be a little fiddly in places for some players. Another is that even with the advanced options—Poaching & Blocking, Opening a Buffet, and Surprise Parties—the game is not that complex and not that satisfying. At least not for the hardened gamer, but to be fair, Just Desserts is not designed with them in mind. Such a gamer will be better off with FLUXX or any number of deeper, filler games. With its light theme and its cheery artwork, Just Desserts is a light and likeable card game, best suited to a family audience with casual or younger players. Add a Review for "Just Desserts"